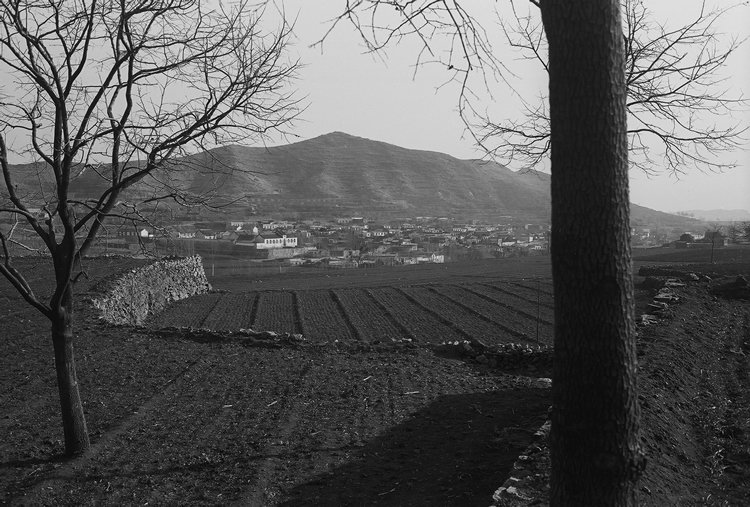 This collection of photos was taken by Roger Blobaum in 1975 and 1976 near the end of the Cultural Revolution when almost all of China’s food was being produced in a nationwide system of party-controlled agricultural communes. 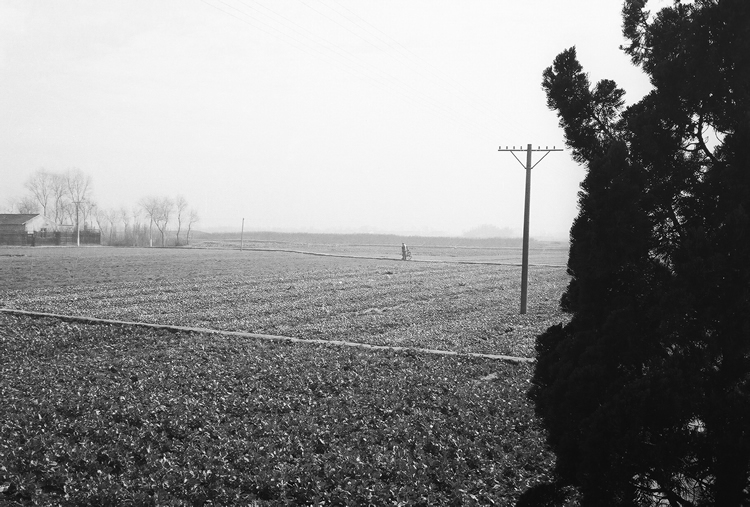 Roger had total freedom to take pictures during five weeks of travel in China, most of it in the countryside. Canals in many agricultural areas are drained and cleaned during the winter to recover eroded soil and fish-produced organic matter and mix it with compost applied to land. Farmers pick up bags of nitrogen fertilizer manufactured from coal in one of 800 small plants in rural areas. Small amounts are applied to supplement organic fertilizer that supports multiple cropping and relay planting in many rural areas. Fields like these have been farmed as long as 4,000 years without destroying their fertility or their ability to produce two, or even three crops a year. Low-tech greenhouses make wintertime food production possible. 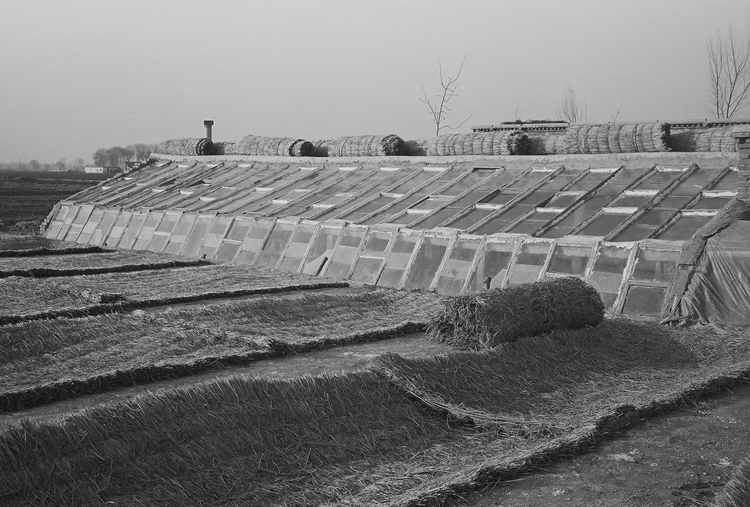 Straw mats are rolled out on cold nights to protect food crops growing inside. The Lou-Tang commune near Shanghai has 120 walking tractors, two-wheeled gaoline-powered units manufactured since 1964 that are displacing water buffalo in most farming areas. This model, which also provides belt pulley power for small rice threshers and similar equipment, was designed to meet the needs of farmers working small fields. 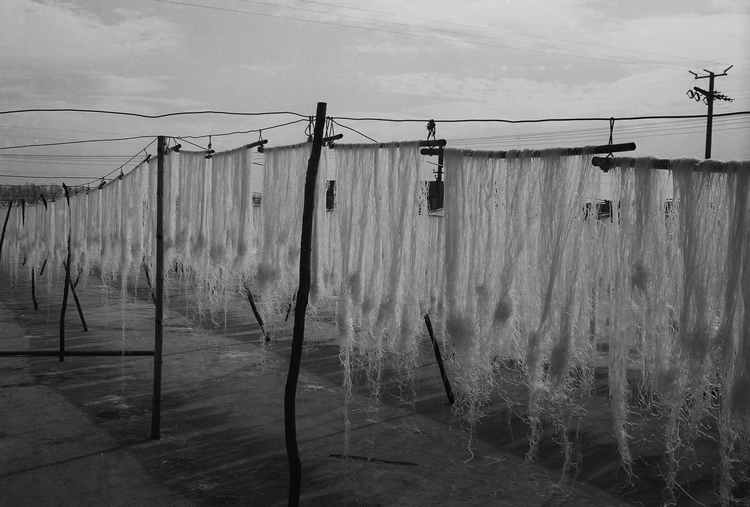 Sweet potato starch noodles dry in the sun at one of thousands of small food processing operations operated by agricultural communes in rural areas. 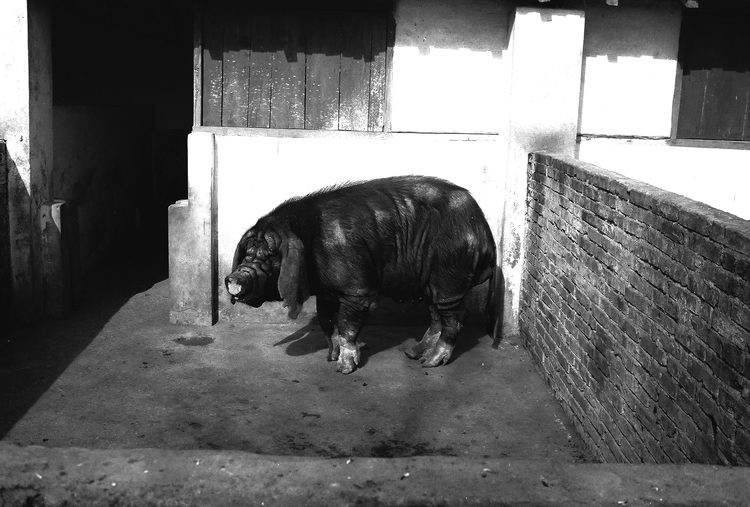 Desired characteristics of pigs traditionally maintained by Chinese households over many centuries include gentle dispositions and unusually large litters. Pigs also are being used increasingly to consume byproducts of food milling and processing. Restoring and leveling eroded cropland is a commune wintertime activity in some agricultural areas. Rug and fan making, hand embroidery, and similar artistic work that utilizes skills handed down through generations, are a common wintertime work activity, and produces beautiful items that can go into the export market and provide extra income for agricultural communes. Narrow roads in rural areas are heavily used by pedestrians, bicyclists, and farmers driving walking tractors pulling farm equipment, making driving of buses and trucks, slow, and dangerous. All high school students are required to complete courses in agriculture and school gardens provide year-around on-site opportunities to gain both food growing knowledge and practical experience. 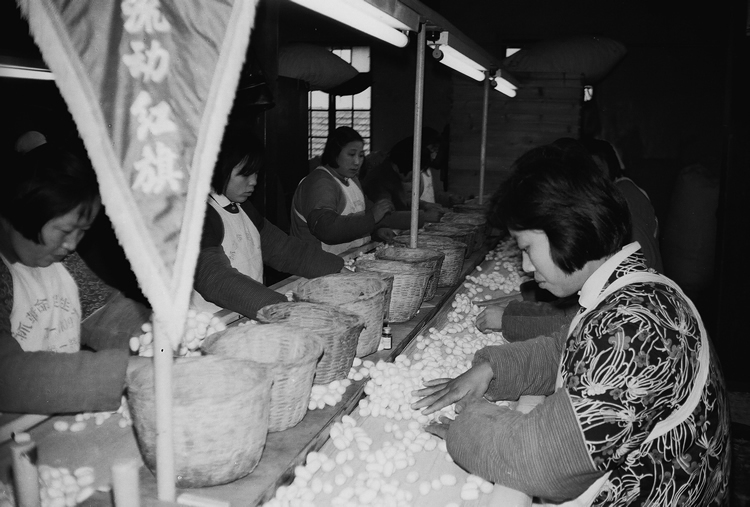 Cocoons spun by silkworms feeding on mulberry leaves are sorted and soaked to loosen natural fibers in the first step of the labor-intensive process of making silk in facilities managed by communes in many areas. Every effort is made in urban areas to fully utilize open land for year-around food production. The narrow highway connecting Nanking and Yangchou is a maze of bicycles, two-wheeled carts, and other slow-moving vehicles that challenge a bus driver’s patience and overworks the loud horn that helps clear the way. Unusual obstacles include a stretch where rice is spread to dry in the sun on half the black-topped road. In fields along the way, thousands of men and women work the land with hoes and other tools as their ancestors have for centuries. Others with baskets and shovels clean silt from irrigation ditches, spread compost, scrape mud from canals and fish ponds, and level fields. Water buffalo sun themselves here and there and occasionally one is seen pulling a plow. The only evidence of mechanized farming in this typical rural scene in Kiangsu Province are a few tractors, both small hand types and old Russian-made models, pulling carts along the road, and the overhead lines that carry power to irrigation pumps and other rural electric outlets. Is this the agricultural system the People’s Republic of China relies on to produce food for a population estimated at between 800 and 900 million, and climbing? How is starvation avoided with such backward methods in a nation with roughly one-fourth of the world’s people? What about diesel tractors and pesticides, feedlots and fertilizer tanks, and other scientific advances that agribusiness companies tell us are essential to modern farming? 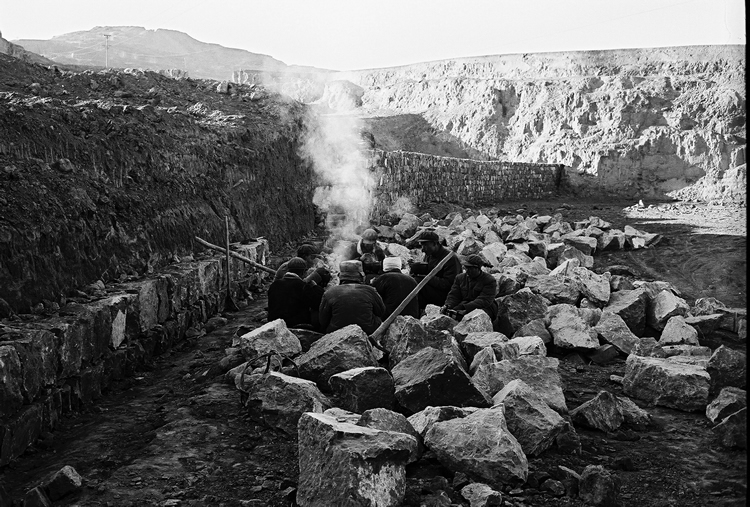 Chines laborers take a lunch break around a roadside fire. Answers to questions like these began taking shape during a visit to Yangchou in late January, probably the most informative part of a 15-day trip through rural China. Yangchou had a prominent place on the schedule because an agricultural college, a research institute, and a huge water conservancy project are all located there. We were told that we were the first Americans to come to that area since the 1940s. Water project engineers explained how irrigation and flood control developments now protect most of China’s best cropland, a tremendous achievement in a country plagued through history by drought and devastating floods. A fast-developing program of problem-solving research and technical assistance to people on the land was outlined by scientists at the institute. And professors at the college told how their students spend time working on the communes, with peasants evaluating their performance and submitting their grades to the school. My conclusion from this and other eye-opening visits to other farming areas is that China, staggered by starvation and disease when it closed its borders to Westerners more than 25 years ago, has built a strong agriculture and appears now to be doing a good job of feeding its people. It has done this by making agriculture its first priority, adopting a system that stresses productivity of the land rather than of labor, and refusing to replace labor-intensive practices proven over the centuries with energy- intensive technology. The question of whether this agricultural approach is working no longer needs to be evaluated on the basis of reports from Peking. A recent study published by the U.S. government shows that Chinese peasants and highly-mechanized U.S. farmers now produce the same amount of grain on roughly the same amount of land and that China produces three times as many hogs. The Chinese reported last winter that they have had 13 good crops in a row, an unprecedented record, and much of the credit is given to the extensive irrigation and drainage system. Another significant result of taming the rivers and developing these water projects has been the ability to shift gradually from two to three crops a year–usually two of rice and one of wheat in much of eastern China–with important gains in total output. Although most of China’s arable land has been farmed intensively for 30 to 40 centuries, the fertility of the soil has been maintained through a self-renewing type of agriculture that uses the full range of organic fertilizers. An important source through the ages has been “night soil,” the human waste that is composted and put on the fields in all Asian countries. Other important fertilizer sources include city garbage, which is hauled to the country and composted, and the rich mud reclaimed from the bottom of canals and fish ponds when they are drained and cleaned in the winter months. Livestock manure has always been a valuable fertilizer source in China and the peasants, unlike big U.S. feedlot operators, have never questioned whether it was “economical” to haul it out on the land. Manure will become even more important now as the result of a decision to try to increase hog production to a level of three pigs per acre of cropland. This decision appears sound economically because pork produced for export is becoming an important cash crop for the communes. There is little doubt that the pigs-per-acre goal will be reached because pig manure is considered an excellent fertilizer by the peasants, fresh pork moves well in the city markets, and hogs are being used increasingly to consume the by-products of food milling and processing. 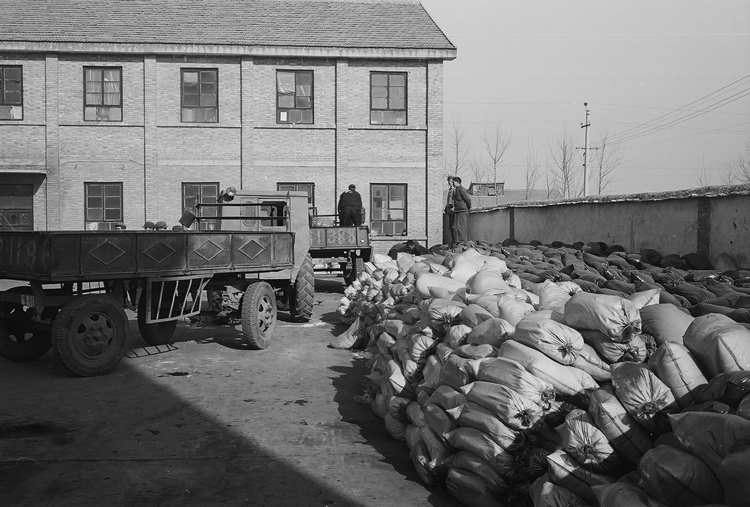 At the Red Star People’s Commune near Peking, for example, by-products from a milk drying plant and a grain milling facility were providing all the feed needed for 1,600 hogs. In a similar setup at Lou-Tang People’s Commune northwest of Shanghai, hogs were getting the by-products from a plant turning out sweet potato starch noodles. Using hogs as waste disposal units in this way, of course, is a modern slant on the centuries-old practice of having a pig in every backyard to consume household garbage and other edible wastes. As more and more land is triple-cropped, however, organic fertilizer sources fall short of requirements and it is necessary to supplement them with inorganic plant foods. About 800 small fertilizer plants are now in operation making ammonium bicarbonate fertilizer from water and coal. China also is constructing 10 large fertilizer plants with a capacity of a thousand tons a day and these are expected to be operational in about two years. The Chinese have plenty of natural gas for nitrogen fertilizer manufacturing but, for now at least, they indicated they will use it only as needed to supplement the traditional organic sources. Mechanization is taking hold slowly, at least by American standards, partly because an incredible amount of skilled hand labor is available. Another reason is that the Chinese, seeing what has happened in countries where farmers have become captives of high energy fossil fuel systems, have decided to commit as little of these non-renewable energy sources as possible to food production. The multiple cropping and relay planting, which are more like gardening than farming, also do not lend themselves to large machinery. It is estimated that 600 million people live in the countryside. Although many are not directly involved in farming, working instead in light industry or providing services in barber shops or clinics or similar places, they are available if needed on an emergency basis to help plant or harvest a crop. The communes, however, have now begun supplementing this vast labor force by purchasing some large Chinese-built tractors ranging up to 110 horsepower. Most popular, however, is the small “hand tractor,” a powerful two-wheeled walking unit that can be maneuvered with ease over the small fields. These gasoline powered units, which also provide belt pulley power for small rice threshers and similar equipment, have been mass produced since 1964 at Tractor Works No. 1 in Shanghai and elsewhere. This tractor probably wouldn’t sell in America because it isn’t much to look at. But the factory manager emphasized that it was designed by engineers who spend their summers out on the communes, is just what the peasants ordered, and will be redesigned anytime they decide they want something else. The input that farmers make in tractor design is just one example of the emphasis on exposure of scientists to farmers and farmers to scientists. The Chinese peasant may look backward, particularly when guiding a plow behind a slow-moving water buffalo, but he is actually involved in a highly-organized program of agricultural education that results in rapid adoption of new farming techniques. Most of the Institute’s research projects are on commune land where peasants propose many of the projects and watch the results. Seventeen problem research centers are set aside for crop experimentation. Both professors and technical people carry the program of experimentation, popularization, and demonstration to rural areas. Production problems that appear are researched promptly, mainly because the Yangchou institute’s “open door policy” keeps its staff on a three-year rotation. They spend one year doing research at the institute, another working on research projects while living and working with the peasants, and the third year touring the province to gather information on problems to be researched and to share research results through adult education classes. The research projects also stress the need to keep food free of chemicals and to create an agricultural environment that will endure indefinitely. The projects include work on better methods of controlling weeds without chemicals, of propagating and releasing beneficial insects, of developing insecticides made from herbs, of improving strains of bacteria added to the soil to speed decomposition of crop residues, and of expanding an extensive program of biological control of insects. They reported good results with breeding “nurseries” turning out millions of bugs to attack and eat aphids, for example, and said the golden bee released several years ago has been effective in controlling the cotton boll weevil. Can this strong commitment to agriculture be sustained in a country like China where there clearly are needs for development of heavy industry and other sectors of the economy? One can only conclude that the total involvement of people in this effort, and the painful memories many have of starvation in the past, will make it possible to maintain this momentum. There is no need in China to remind people where food comes from or for direct farmer-consumer marketing arrangements aimed at easing the economic stranglehold of a highly concentrated food industry. It is likely that more people have first hand knowledge of agriculture in China than anywhere else in the world. 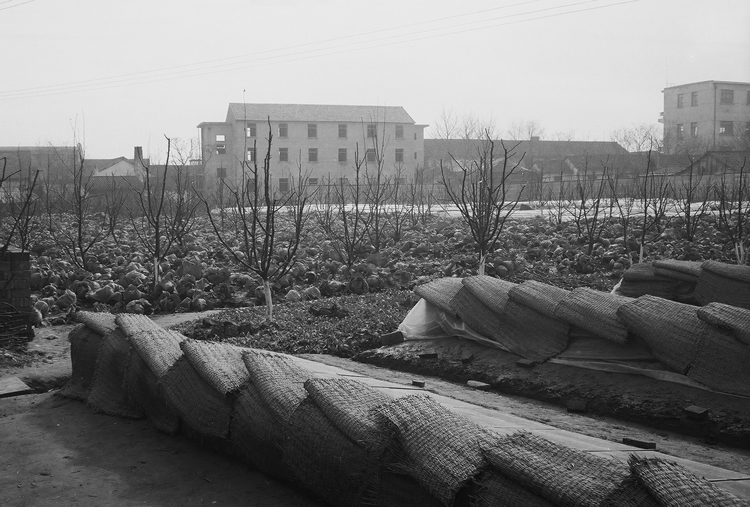 Even the soldiers in China are required to produce most of their own food on their own bases. 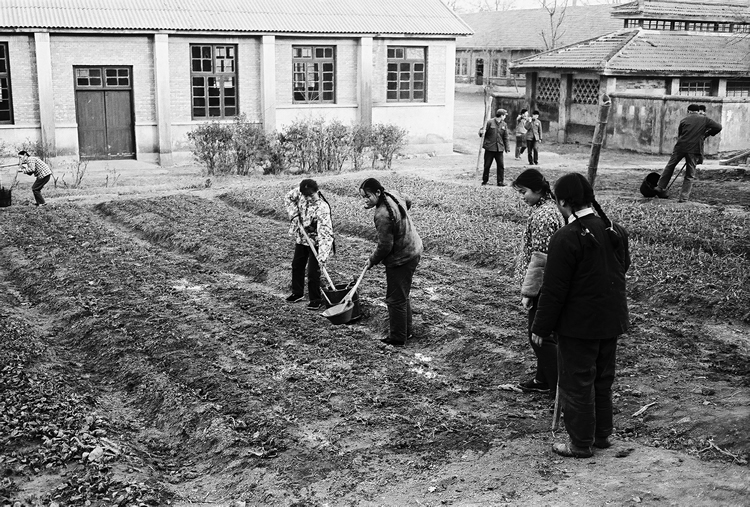 All high school students are required to complete courses in agriculture, for example, and all city people in China spend a month every two years working on a commune as a kind of sabbatical. A large proportion of the high school graduates also work on communes for a year or two during the period when they are making arrangements to enter an apprenticeship program, enroll at a university, or take some other kind of training. Another strength is the commune system itself, which has retained some personal incentives not usually found in a communal society. It includes a system of work credits for labor on the land, sharing of profits from other commune enterprises, and the small private plots where rural families produce most of their own food, keep a pig and some ducks or chickens, and are able to sell whatever produce they can spare on the open market. The rural commune typically covers an area the size of a Midwest rural county, involves anywhere from 15,000 to 50,000 people, and is set up much like a large farming cooperative. The communes are organized into brigades, which do most of the accounting and handle things like leasing machinery, and work teams that are made up of 20 to 30 families in a neighborhood who work the land in common. 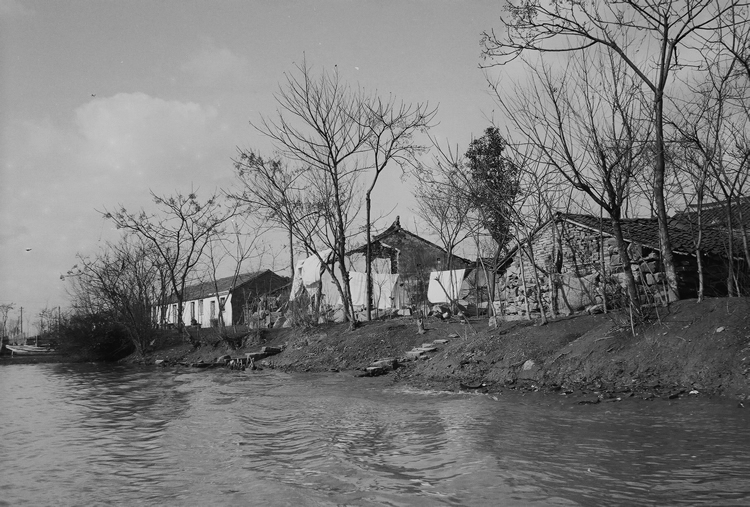 The Lou-Tang Commune, one of the 190 in the Shanghai area, is a typical example with 15 brigades and 138 production teams working a total of 2,400 hectares of land. This commune was set up in 1958 with about 24,000 people in 5,770 households. Rice is grown on 50 percent of its land, cotton on 45 percent, and vegetables on the remainder. It also produces about 36,000 hogs a year. The commune also has 24 large tractors, 120 walking tractors, and has 95 percent of its land under electrically-powered irrigation. 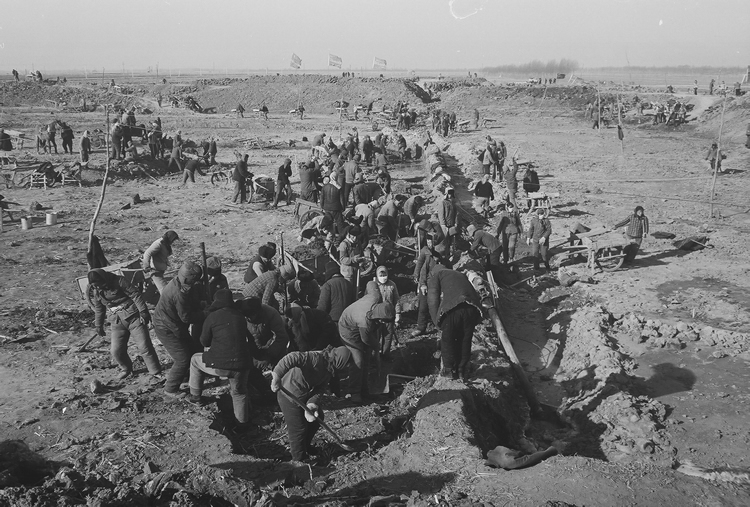 The communes provide such services as farm implement repair and maintenance, hospital services, management for large dairy and other livestock enterprises, carpentry and blacksmith shops, and a wide variety of jobs in light industry. 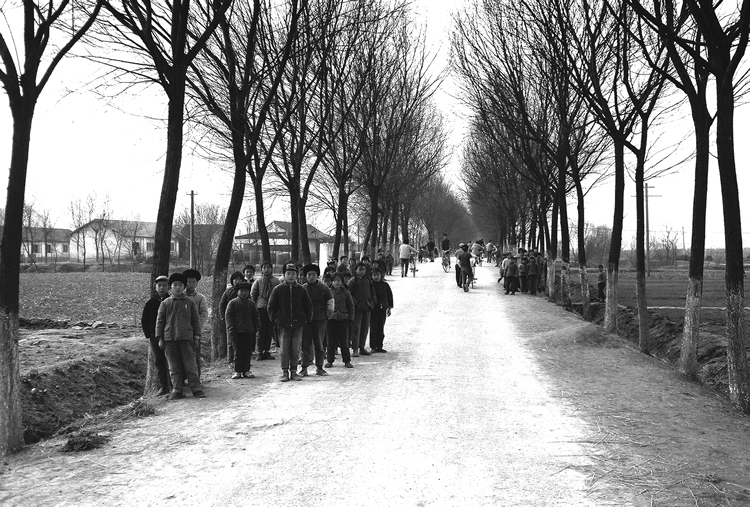 Most of the peasants live either in the town where the commune is headquartered, which is much like a county seat in a rural area, or in homes clustered in villages or scattered across the countryside. A few have moved into new workers’ apartments, making their former mud homes available for conversion to livestock shelter. This system also makes it possible to implement a policy of keeping people on the land and avoiding the kind of mass movement to the cities that has caused such critical social and economic problems in Third World cities, not to mention our own metropolitan areas. The light industry being developed in rural areas is the kind that is labor intensive and that can operate so more jobs are available in winter months when farm work is slow. The emphasis is on things like basket weaving, fan and rug making, and hand embroidery that utilize skills handed down through the generations and that turn out beautiful items that can go into the export market and provide a good cash return for the commune. Also emphasized are silk and tea production, traditional cash crops that involve a tremendous amount of hand labor. China does not yet aim to be the breadbasket of Asia. The hard-won miracle of the past 25 years has been more immediate and basic than that. Commune by commune, China has become a nation of local breadbaskets, economically interdependent and yet at the same time self-sufficient. With a commitment by the whole society to share both its resources and its labor, it would seem that, for China at least, the ancient cycle of recurring famine has finally been broken. This article was published in the July, 1975, issue of Ramparts Magazine. 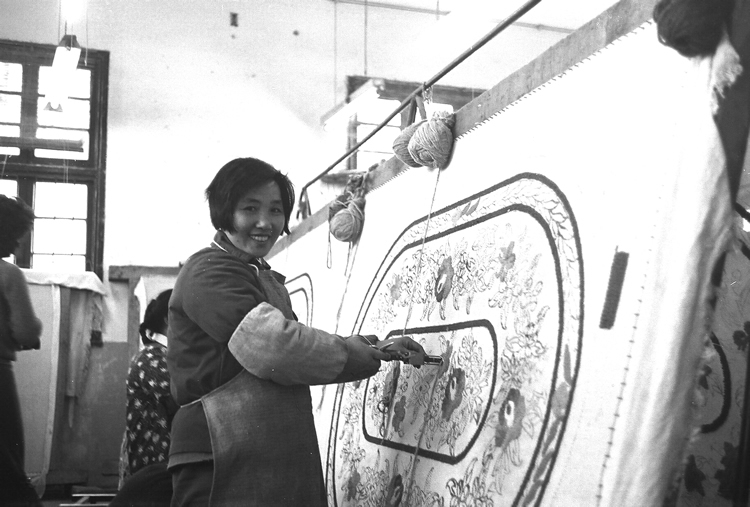 Blobaum visited China in January, 1975, with a group of Kansas farmers. 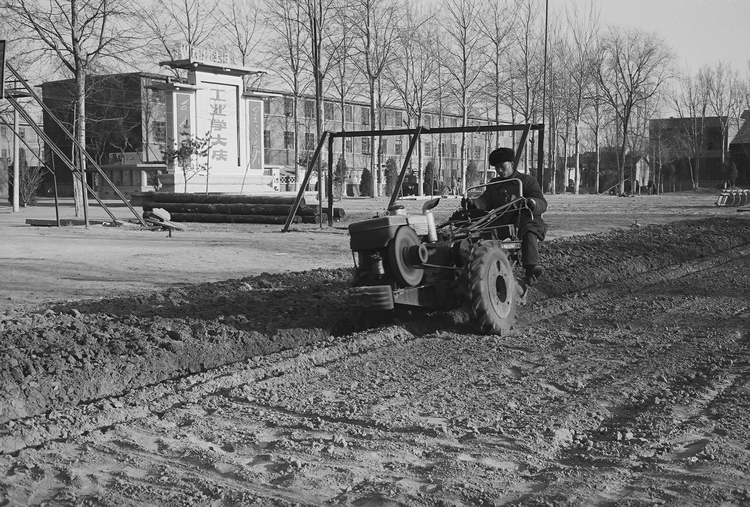 It was the first group of U.S. farmers invited to travel in rural China while the Cultural Revolution was still underway and the country was closed to Americans and most other outsiders.